The worst part of being a critic is reviewing derivative, mediocre works. It’s a strange problem that often causes division between the critic and their audience. Why? Well, audiences often like mediocre, derivative things if they’re similar to what they already enjoy. This is most pronounced with movie criticism, where there’s often a sharp divide between critical and popular tastes. Look at the new Aronofsky movie, Mother!, which is getting absolutely horrible feedback from moviegoers, but is doing pretty well among critics. It’s not that critics are snobs (though some are) or that moviegoers are dumb (though some are). Instead, it’s mostly that Mother! was something unique and different. It took risks, and it was bold. It has an absolutely frenetic final act that’s as weird and dizzying as it is loud and brash. It’s also a giant theological metaphor in movie form. When you’ve seen a dozen Greengrass-clone action movies and predictable rom-coms this week, Mother! grabs your attention because it’s actually trying to do something novel. This is not nearly as much of an issue with boardgaming, yet, but I see it seeping through the cracks. The main barrier holding it back is that there’s a higher cost of entry when it comes to board games, in both money and brainpower. This keeps the hobby away from the (vaguely defined) “masses” and also incentivizes people to be more careful with their consumption. If they already have one worker placement game they like, they’re more likely to scrutinize shelling over $60 for another one unless there’s something different to experience there. However, the success of Cards Against Humanity and Exploding Kittens has brought out a number of derivative copies, and from what I can tell they’ve been moderately successful. 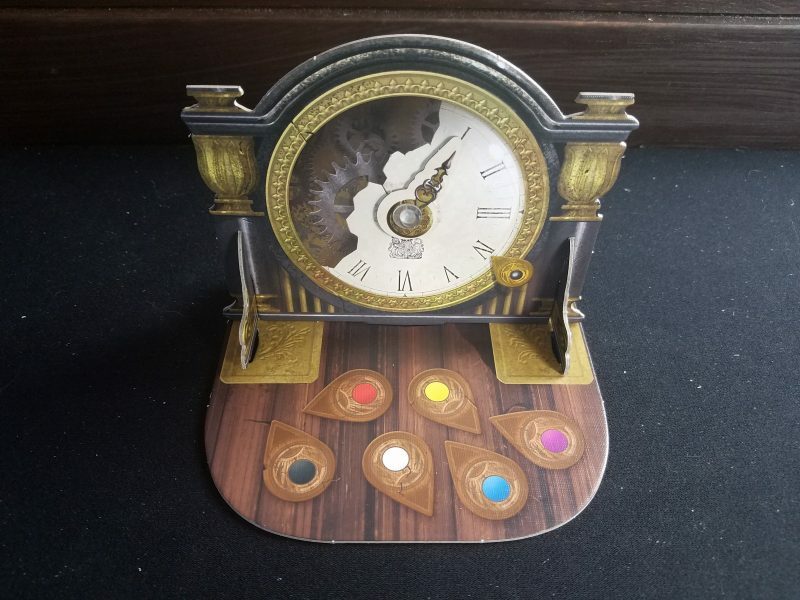 All of that to say that Mysterium manages to be both a novel and interesting construction that’s also going to be popular with the large majority of people. Here’s a game both intelligent in its design and easy to play. Easy once you understand it, at least. The rulebook is truly one of the worst I’ve ever slogged through. It makes the game seem twice as complicated than it is, and the organization makes absolutely no sense. Here’s the gist: Mysterium is a cooperative game where one person plays as the “ghost” who must lead a group of mediums (the rest of the players) to the correct culprit of a murder at some kind of spooky house. Clue-style, you must figure out the murderer, the location, and the weapon used. Actually you’re trying to figure out individual murderers, locations, and weapons for each medium present. It…..doesn’t make a lot of sense. Regardless it creates a fantastic gaming experience. See, the ghost is not allowed to speak to any of the other players and communicates entirely through “dream” cards, which display absolutely fantastic surrealist/expressionist art. There’s a giant stack included in the game, and they’re equal parts weird, magical, and mysterious. Once everyone gets their dream cards for that round, they try to guess to where the ghost is leading them. In addition, everyone can guess on their friend’s guesses (either right or wrong) and gain points to be used in the end game. The cards can be so vague and obtuse that sometimes you just burst out in laughter at the absurdity of it all. This is a co-op game that has taken the one part of co-op games that can be tricky–the randomizing element–and completely subverted it by putting it entirely in the hands of another player. You don’t feel like you’re playing against a mindless game so much as you are against the limits of communication (imposed by the game, but w/e). So when you fail to guess correctly time after time, it’s not the roll of a die or the fate of a deck that’s putting you in this situation, it’s your stupid mute friend behind the screen. From the ghost player’s perspective, Mysterium is a game of delightful, very specific torture. The mental anguish of listening to your friends convince themselves of ENTIRELY the wrong answer with confidence is both a horrible and amazing experience. You can’t say anything, and that’s hard. You feel your blood pressure rising as the weight of the game slowly descends on your shoulders. Ultimately you only have 7 rounds to guide everyone through 3 sets of clues each, and it’s tricky. The card selection is one thing, but the ineptitude of your playing partners is an entirely other matter. Okay, as you might be able to suss out, I recently played as the ghost and lost. But I’m not bitter. I gave brilliant clues. It was all their fault. 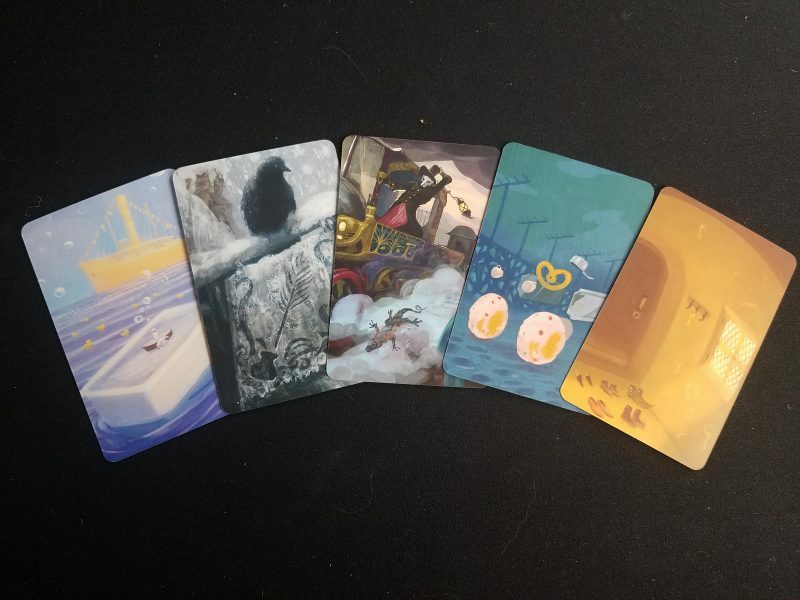 One of the best parts of Mysterium is that while the ghost can only communicate through the dream cards, the other players are talking about what they mean in front of the ghost. So, when they inevitably fail, you have to start thinking about their comments and try to tailor your card choices to their specific form of mental gymnastics/art interpretation. However, if one particular type of interpretative strategy doesn’t work, does that mean that they won’t follow that path in the next round? Of course, if the players communicate their expectations directly to the ghost, the entire thing is ruined. Like with Hanabi, the magic in Mysterium is dependent on the players not codifying any norms of behavior. Even if you’re trying not to do this it can be hard to avoid, for instance, making one particular dream card always mean a certain thing. There are a good number of dream cards included, but if you play a couple of games in an evening you’re going to start seeing repeats, and that familiarity is difficult to work around. Instead of a game night mainstay, then, Mysterium is a perfect game to use to introduce people to the world of modern board games. It’s easy to learn (if someone’s teaching you–not through the rulebook), has enough familiarity with concepts people already know about (like using one thing to clue to another thing, or the conceit of “Clue”), and, frankly, it looks awesome on the table. There’s beautiful, creepy artwork over everything, the screen the ghost hides his information behind is large, sturdy, and imposing, and even the admittedly ostentatious clock used to keep track of the round progression adds to the ambiance. Of course, part of me wishes they’d made it a more modest production and cut down on the cost of the game. It has the weight and table presence of a much more detailed, longer game. That said, it’s not necessarily for everyone. In my experience I’ve seen the game fall flat among who I’ll call “very logical” people. The linear, straightforward thinkers who like to solve problem and take everything head on. They might not appreciate the very abstract puzzle here as something crazy and fun, but instead see it as an annoyance. Okay, I mean, it is annoying. But in a fun way, you know? For me. But if the game is going to fall flat, it’s going to be flat as a pancake. This is because there are so few key decision points–8 significant ones at most for each player, that if you don’t get a sense of importance from each of those game decision nuggets, it seems pointless. You have to have a sense of optimism that there’s something to be gained from the dream cards or there’s no point to the game at all. Against the inevitable progress of time, isn’t it all pointless? I also can’t quite get away from how dumb the game is from a narrative perspective. If the ghost knows the details of the murder, why are they leading each individual person to a different murderer? And then once they’ve done that with everyone, why, in the final round of the game, do they get to just pick who the “real” murderer was, making everyone guess a final time? And why, in a game all about trying to work together to decipher the clues, is the final round a secret ballot vote? I mean, I understand why from a purely mechanical point of view. You want to add some more meat to the game, so you add the ability for people to vote on everyone else’s guesses. Cool! But now you need some kind of reward structure for those guesses. Nothing fits into the standard game, so you add an end game. Great! A final phase where everything can culminate into one final guess. And the points that people accrue can determine how many clues they see before they make their guess. But now since people are guessing with different amounts of information it needs to be a secret ballot vote. And this phase doesn’t really jive with the story of the rest of the game. Honestly, it’s not that bad, but it is a mental hurdle you need to jump over in order to get the full experience. Played occasionally so the cards remain fresh, Mysterium is one of the most unique, memorable, and beautiful board game experiences out there. Yes, Dixit did the surreal art thing first, but it didn’t do it like this. Dixit built upon the lighthearted shell of an Apples to Apples-style party game and maintains an air of levity. Mysterium builds tension and creates frustration. And then from those emotions it creates moments of pure suspense before the ghost reveals the truth. It’s good. It’s very good. Nice review! I agree, the lack of variety in the cards makes it difficult for replay-ability with the same group of people. But I’ve had great success bringing it out, as you said, to people newer to the world of board gaming. 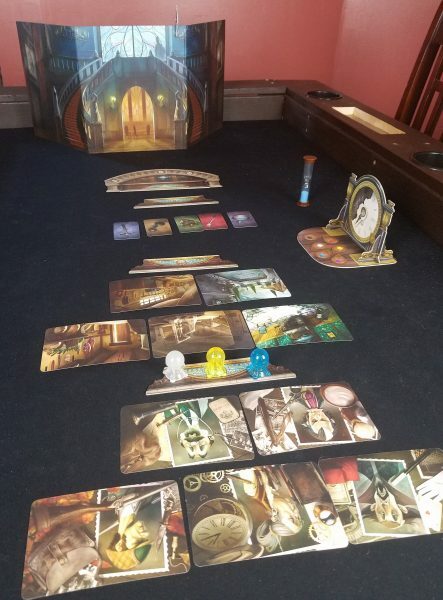 There’s just something unique and captivating about Mysterium! Absolutely. It’s such a cool experience that I wish it could stay fresh forever. As it is we’ll pull it out every few months and it’s great.